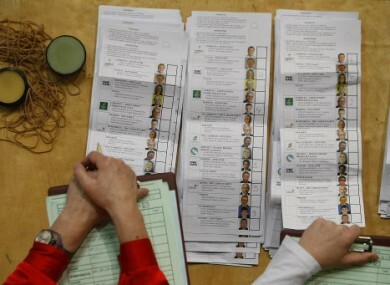 The count is underway in Dublin's RDS. DUBLIN VOTERS HAVE BEEN delivering a very clear message to the government parties, according to the initial tallies and an exit poll reported by RTÉ this morning. In contrast, Fine Gael and Labour have been polling strongly across the Dublin constituencies. While that exit poll gave Fianna Fáil 15.1 per cent of overall support across the country, the party registered just 8 per cent of support in Dublin. Early tallies have put Brian Lenihan in sixth place at 14% of votes in Dublin West – a four-seat constituency – however, his brother Conor Lenihan has conceded his seat in Dublin South West. Former ministers Barry Andrews and Mary Hanafin, who were both contesting in Dun Laoghaire, may not retain their seats. Averil Power could struggle to take the third seat in Dublin North East. Academic and former president of DCU Ferdinand von Prondzynski told TheJournal.ie that it looks extremely bad for Fianna Fáil, and said it seemed voters wanted “somebody to burn”. However, he said that he couldn’t understand what people who typically voted Fine Gael instead of Fianna Fáil thought they were doing differently. ”Labour or Sinn Féin would be different perspectives. But it’s perhaps not the most logical thing,” he added. Meanwhile, Fianna Fáil’s former coalition partners the Green Party could end up without any seat in the 31st Dáil. Green Party leader John Gormley appears to be set to lose his seat in Dublin South East.With all the ballot boxes open in Gormley’s constituency, the Green leader has just 6.7 per cent of the vote. 10% of tallies counted. All in my strong area. Loads of 2, 3, 4, which is comforting, but not enough No. 1s. I concede, with good grace. Reports are also emerging from Dublin South that Eamon Ryan is preparing to concede his seat, after initial tallies proved disappointing for the former minister. My guess would be they may be completely finished. The Green Party, in a way, was party of a period when green issues were, arguably, not so mainstream. Now you could argue that the green agenda has been taken on by other parties. He added that a political commentator had once said Green votes were in a sense “biodegradable”, meaning they go back to where they came from. Email “Voting trends: voter vengeance for Fianna Fáil and the Greens”. Feedback on “Voting trends: voter vengeance for Fianna Fáil and the Greens”.